Because, errr…we did! And it all exploded in my face, and now I smell horrendously bad. You see we had to mix sodium hydroxide with vinegar – and then the subsequent reaction would blow up a balloon…amazing I know! What I wasn’t warned about was that if the kid hadn’t attached it all together properly this would launch madly into the air, and slather me in wretched liquid! Now I have a meeting, and no time to shower…excuses people – quick, quick, quick!! 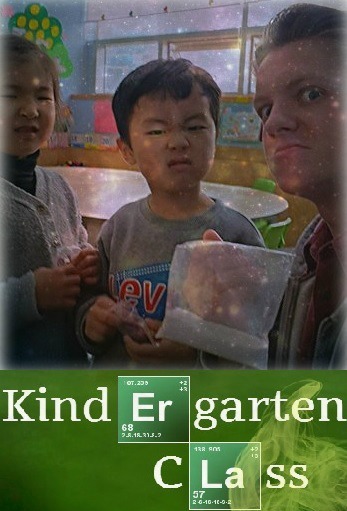 This entry was posted in Silliness and tagged amuse, amusing, bad, breaking, breaking bad, child, children, comedic, comedy, esl, expat, foreigner, fun, funny, humor, humour, joy, kids, kindergarten, korea, laughing, laughs, positive, Seoul, south korea, suwon, teach, teacher, teaching, travel, traveled, travelled. Bookmark the permalink. Just be honest…Let them know you were educating kids…It will touch the heart strings lol. Never mind. I knocked sulphuric acid over my teacher’s trousers once – they were in ribbons. Still, he was ok.
WEll….I didn’t really knock it, so much as fail to wash some jar or other correctly, which had had chlorine in it. And when he connected it up and set the bunsen burner going the whole thing exploded and he emerged from the smoke rather smudged, with his trousers in tatters, because of the acid that the reaction had made. I’m afraid we all laughed, heartless teenagers that we were. You should just walk in and pretend everything is normal, and if people ask questions just pretend you don’t know what they’re on about. You don’t know about “Wear Your Dirty to Work Day”? That’sit- give that kid an A+! I had a class of first graders do a paper mache’ project. I didn’t know that when one girl bent over the bucket of wet paste that another girl would choose that moment to slick off extra paste from a piece of newspaper on top of the first girl’s hair. Should have thought that project through a lot more thoroughly. Also ended up chipping dried paste off the tables, floors and chairs for an hour at the end of that day…Really enjoy your teaching posts.